to cheer you up on a cold and dreary winter’s day. I don’t know what your favourite winter pick me up recipe is but this sure does it for me every time. As with most things made fresh at home this crumpet recipe we have created makes crumpets that taste so much better than anything you can find in a store. 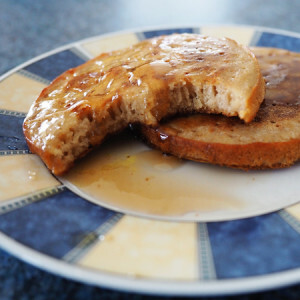 So we were very excited to share this recipe with our Gluten Free Recipe Club members in June (you can still get access the the crumpet recipe with a VIP Recipe Club Membership). Imagine sitting by the fire enjoying fresh crumpets this winter, crumpets dripping with butter and honey…or whatever your favourite topping is. Anyway back to the purpose of this post which is to share with you this quick and easy tutorial for how to make your own crumpet rings. 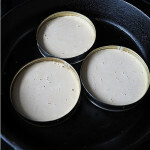 As although you can use egg rings to make crumpets they are a little small and shallow where as these home made crumpet rings which will give you the diameter of store bought crumpets plus they also allow sufficient depth for your crumpets to rise properly while cooking in the pan. The double size cans of fruit are perfect for making crumpet rings, and you get to enjoy the fruit first! 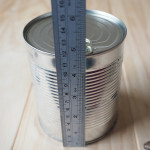 The can must be a metal only can, not the sort with a plastic coating inside. The can opener needs to be the sort that only removes the lid from the inside (not the whole top of the can) as you need the thicker top of the can to remain to make the crumpet ring strong enough. Use the can opener to open can completely and empty of contents, open the bottom side as well so you now have an empty cylinder. Clean the can and remove the label. 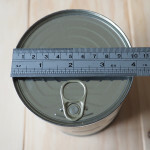 Measure 2cm (¾”) from the edge towards the centre of the can and mark a small line, repeat on the other end of the can. Using the pointy end of the scissors or your pointy object pierce the can at the place you marked. Slide the scissors into the hole and start slowly cutting around the can, being careful of the sharp edges. 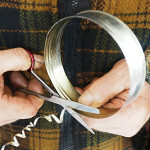 Repeat steps 4 – 6 on the other end of the can so you now have two rings. Once you have your rings cut out and trimmed to size take the sand paper, fold it in four and carefully sand the cut edge to remove any sharp bits. Wash your rings thoroughly and then they are ready to use. When using in the pan ensure the end opened with the can opener is touching the pan as this is thicker and ensures your crumpet batter won’t leak out. These rings can be washed and reused and should last you many years. As the Goodness Me Recipe Club Crumpet recipe (available with VIP membership) makes 6 crumpets you might want to make 6 rings which means you wont have to fuss with oiling the hot rings during cooking.